How to resize a Klip – How can we help you today? 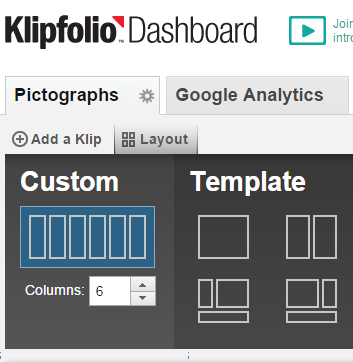 Klipfolio lets you customize the layout of any dashboard. By improving the appearance of a dashboard, a group of Klips becomes much easier to understand and visualize. You can apply a basic template to your dashboard or you can apply a custom layout by selecting the number of grid columns you want to work with when arranging your Klips. At the top left of a dashboard of Klips, click the Layout link. Click the Custom grid icon. In the Columns box, type the number of grid columns you want to use. Drag a Klip by the titlebar to anywhere on the dashboard. Adjust the height and width of a Klip using the resize handle located in the lower right corner of the Klip. Tip: Click and drag the lower right corner of a Klip up and towards the center of a Klip to quickly minimize its size. Align your Klip by dragging it towards a grid column and allowing it to snap into position.